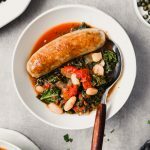 This one-pot Italian chicken sausage recipe is easy enough for a weeknight dinner and special enough for company. Made with less than 10 ingredients, it’s healthy, hearty and definitely one for the books. I love this dinner. It’s got everything I look for in a cozy, cold-weather meal. Tons of greens, protein, and of course, flavor. 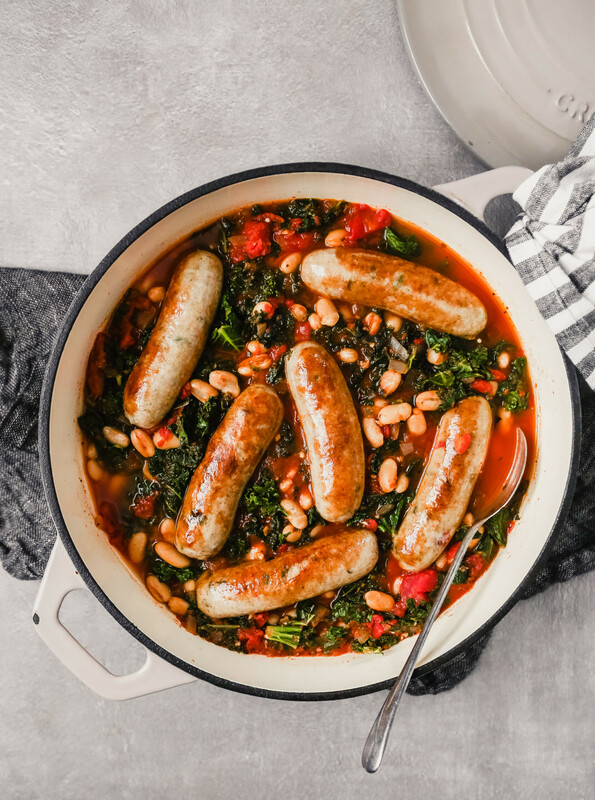 There’s no doubt this meal is hearty and comforting, but it’s hearty in a sense that it fills me up without being heavy. And by layering flavor every step of the way, this recipe relies on a few quality ingredients to pull the weight instead of added fat and salt. 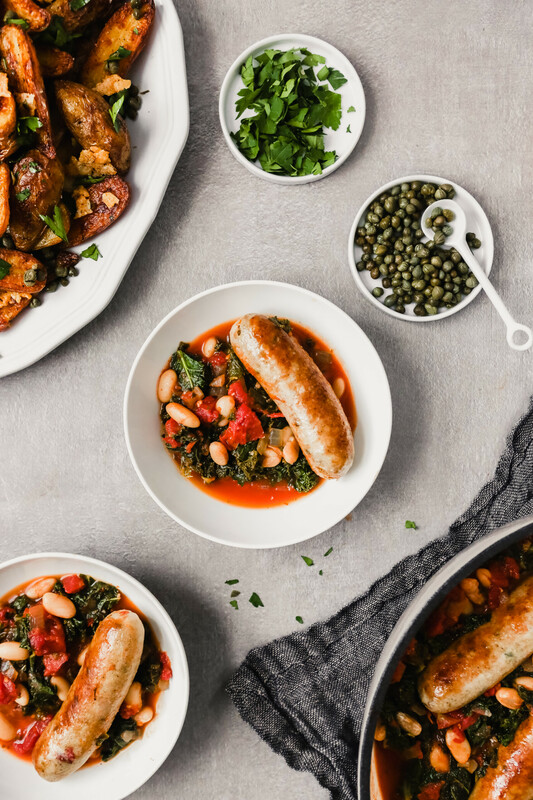 Classic Italian sausage links would be great here, but I wanted to create a dinner that had all of the aspects of comfort food without the added grease. And chicken sausages were the answer. 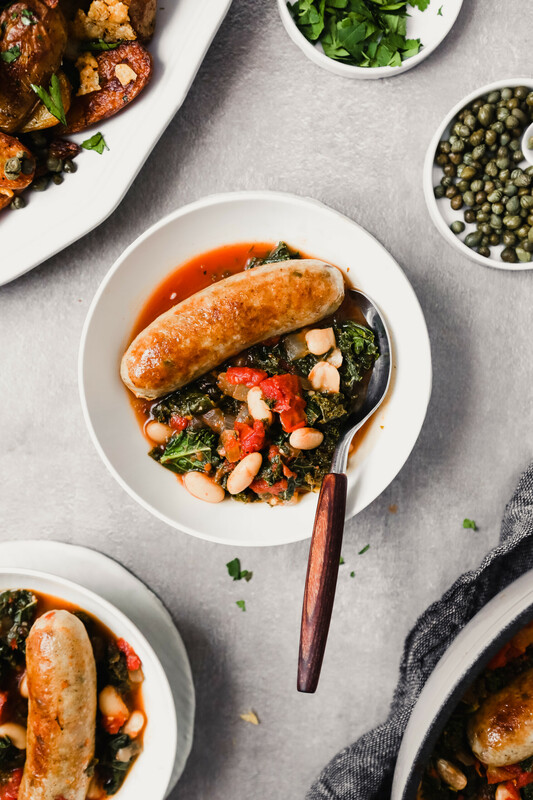 With so many options for chicken sausage nowadays you can definitely find some with great texture and bold flavor. In general, chicken sausage is a great way to add protein and flavor to a dish without adding a ton of saturated fat. Like with anything, there will be a few outliers, but most chicken sausages are lower in fat than their pork counterparts. 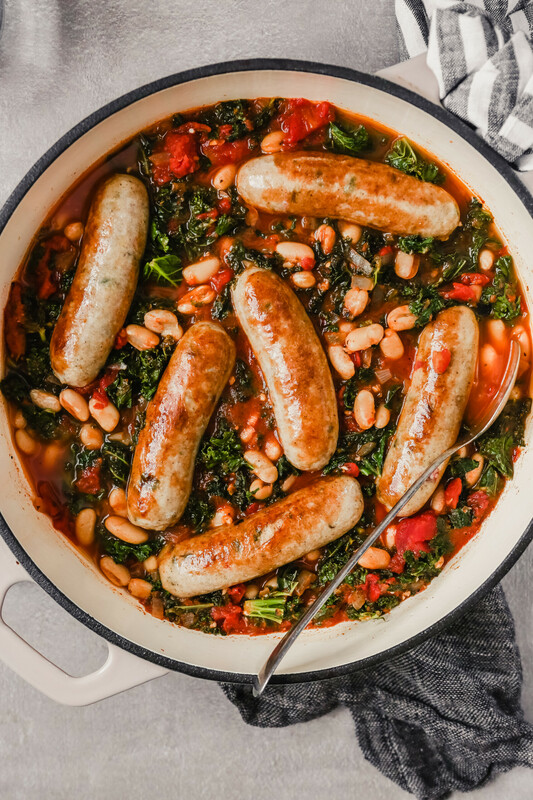 If you’re watching fat content, look for sausages that have 7–10 grams of fat and around 2 grams of saturated fat per serving/link. Both of which are pretty normal ranges for chicken sausages. Be sure to look at the ingredient list, is sugar one of the first ingredients? If so, look for a different flavor or brand that has sugar towards the end of the ingredients list, preferably in the 2% or less segment. 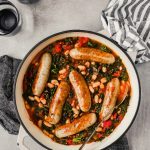 As a guideline, I look for sausages that have 4 grams or less of sugar per serving/link. Just about any chicken sausages you’ll be able to find will be precooked. It’s best to get in the habit of double checking the label to verify, but most chicken sausages will be fully cooked. Another beauty of chicken sausage! How long do chicken sausages last? Unopened chicken sausages will last about 2 weeks in the refrigerator. After opening, chicken sausages will last 1 week in the refrigerator. Chicken sausage will last about 2 months in the freezer. How else can you serve chicken sausage? 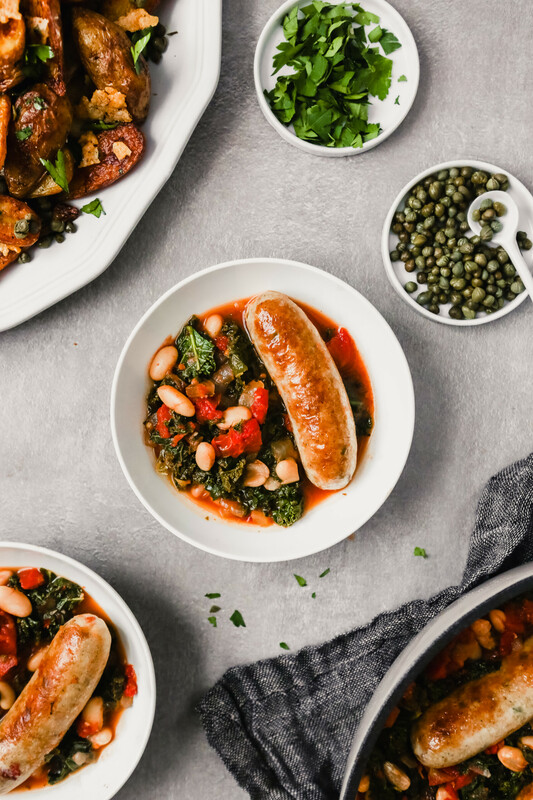 You can serve chicken sausage in a variety of ways. Here are some of my favorite methods. Slice sausage into coins then sauté with mushrooms, then toss with greens for a quick salad. Slice sausage into coins and toss with peppers, sweet potatoes, greens beans, a splash of olive oil and a few spices. Arrange on a baking sheet and roast (or grill in a grill pan) until veggies are tender. A quick and easy sheet pan dinner. Slice sausage into coins and saute until golden brown. Toss with pasta and a creamy sauce. 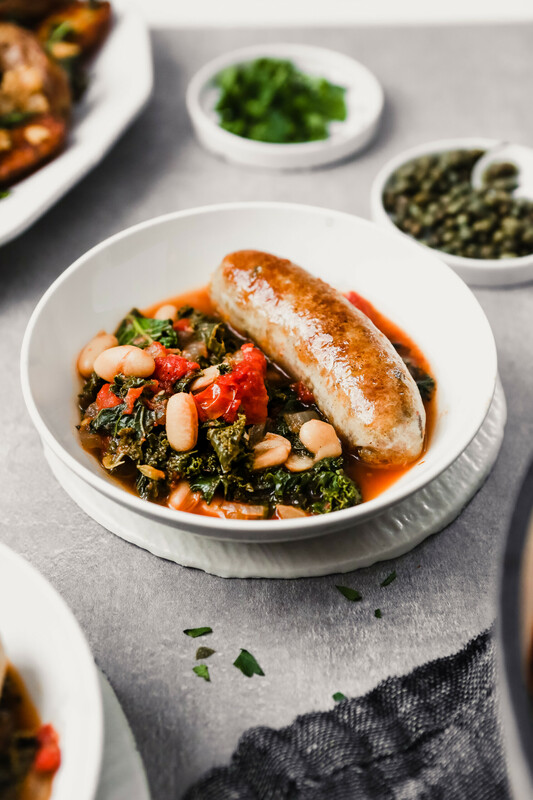 If you’re feeding a hungry crew, having guests over, or want to make a special meal, check out my Easy Sunday Night Tuscan Dinner Menu! It features some really delicious crispy potatoes. This recipe was inspired by a recipe from America’s Test Kitchen’s cookbook Cook It in Your Dutch Oven .